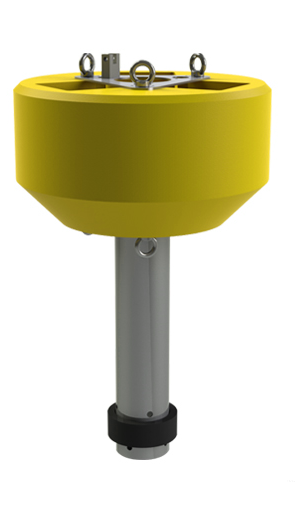 MB-300/MB-400 Buoy Overview - NexSens Technology Inc.
NexSens MB-300 and MB-400 data buoys are designed specifically for offshore water monitoring systems. The floating platform supports both topside and subsurface environmental monitoring sensors with options for radio, cellular, and satellite data transmission. Temperature strings, multi-parameter sondes, Doppler current meters, weather stations, and other monitoring instruments can be quickly deployed in reservoirs, lakes, rivers, streams and protected coastal waters. The buoys are constructed of an inner core of cross-linked polyethylene foam with a tough polymer skin. A 6” diameter pipe passes through the center of the buoy for quick deployment of subsurface instruments. On the topside, a hinge-mount aluminum tower offers quick access to instrumentation for calibration and maintenance. Three topside cutouts accommodate NexSens SP5 solar power packs, which include a 5-watt solar panel, charge regulator, and 8.5 A-Hr SLA battery housed in a watertight enclosure. Top and bottom-mounted stainless steel eyes support mooring lines and lifting rigs for quick deployment. The 300 lb. and 400 lb. buoyancy buoys are designed to accommodate NexSens SDL500 submersible data loggers. The SDL500 is configured with five sensor ports for connection to industry-standard digital and analog sensor interfaces, including RS-485, SDI-12, 1-wire temp string, 0-2.5V, pulse count, and more. Each sensor port offers a UW receptacle with double o-ring seal for a reliable waterproof connection. NexSens iChart Software is a Windows-based program for interfacing both locally (direct-connect) and remotely (through telemetry) to a single data buoy or network of data buoys.